The DCRSG is a cutaway Dreadnought built with a Sitka spruce top and mutenye back and sides producing a beautiful even tone with good bass response and clear mids and trebles. The DCRSG features a comfortable high-performance taper neck and Fishman® Sonitone electronics making this guitar the perfect road-ready companion. Whether you’re performing at your favorite summer festival or entertaining friends by the campfire, Martin’s Road Series won’t let you down. Martin Retros are the original Nickel acoustic string – the real deal – all the way from the 1930s. Retro strings are naturally corrosion resistant and offer a uniquely mellow, yet crisp, sound that allows your guitar’s natural tone woods to be heard, not overshadowed. With Martin Retros, you get one tough set of strings that will last a long time and give you true, consistent tone that sounds like nothing else on the market. Want to win? 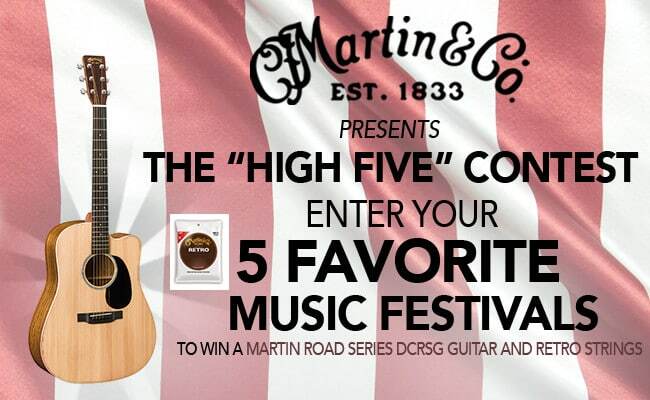 Simply fill out the form below and tell us your “5 Favorite Music Festivals” and you’ll be entered to win the guitar and strings. Selected entries will be printed in our September/October 2018 issue. Deadline: July 31st, 2018 at 11:59pm CST. I have read and agree with the Contest Terms & Conditions.